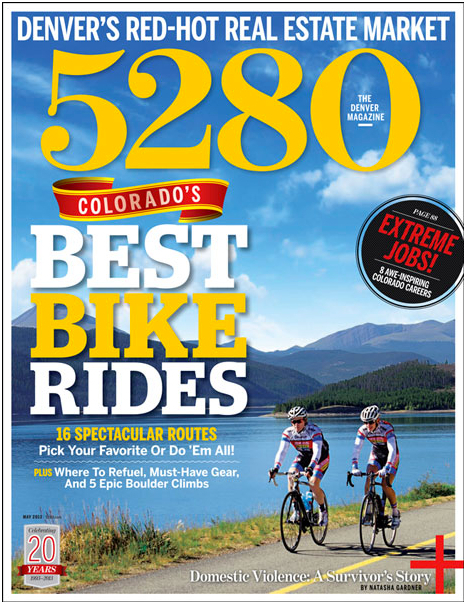 Good news, for all of us who enjoy riding a bike in Colorado and exploring new routes, this month's issue (May 2013) of 5280 Magazine has a list (with maps) of some of our best rides in the State of Colorado. Buy the issue and read over the routes, see how many you have already done, how many are left to be conquered. 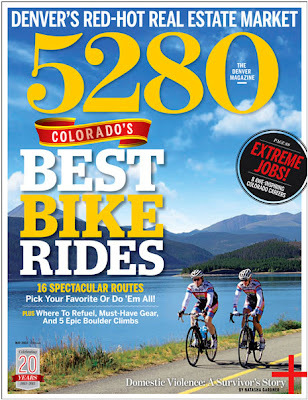 5280 Best Bike Rides, May 2013 edition - on newsstands now! I agree with the list of recommended rides, perhaps because Deer Creek Canyon is not on the list, but most likely because Lindsey B. Koehler, who wrote the piece for 5280 Magazine, seems to know her stuff. The magazine is named after the altitude of our State Capital Denver, which is 5280 feet above sea level. With 53 mountains rising to over 14,000 feet in this State, and our highest paved road at 14,240 ft (Mt Evans), the State of Colorado is one big challenge awaiting any road cyclist. If you are traveling through Colorado on your family vacation - bring your bike. If you are coming to watch the USA Pro Challenge in August - bring your bike. If you live here - you are one lucky bike rider.
" ... With dry roads and sunny days stretching out ahead of us, we’re joining the frenzy—and helping you do the same—by highlighting some of the best road cycling routes (for beginners and experts alike!) along the Front Range and in Colorado’s famed high country. Clip in and enjoy the ride." 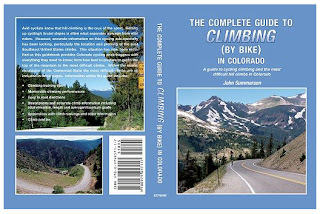 In her article recommending 21 bike rides in Colorado, Lindsey B. Koehler has listed the major nearby city, ride distance, difficulty level, maps, profiles, and most importantly - rest stops or happy hour locations nearby the routes. I enjoy a destination or loop ride, and this 5280 article offers plenty of choices. I could fill the year riding these selected routes; there remain three I have yet to tackle. Denver: The Ride: Confluence Park to Cherry Creek State Park (Easy), Distance: 28.4 miles round-trip, (see the ride) [I personally like the extension of the Cherry Creek Path from the Reservoir down past Parker]. 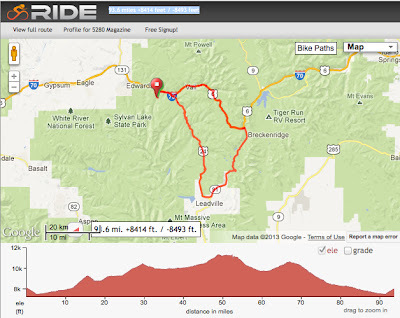 This is one of may favorite rides in the state - the famed Copper Triangle - and it is on the list! 5280 Magazine has added a side jaunt to Beaver Creek. I will have to try this addition. You might have noticed that a number of the cities listed above are Host Cities for the 2013 USA Pro Challenge, so if you are visiting to see the race, be sure to go for a ride before or after your stage viewing.